Top row (left to right): 1. Betty Jordan, 2. Mervyn Frydendal, 3. Margaret Whalen, 4. Wilda Paulson, 5. Isabel Bonne, 6. Bernice Bettencourt, 7. Don Fisher, 8. Norma Lamee. Second row: 1. Mary Perkins, 2. Jack Ferrario, 3. Janice Addleman, 4. Alfred Sterson, 5. Dorothy Reinstein, 6. Robert Grosser, 7. Elizabeth Wagoner, 8. Ernest Ibarole, 9. Alice Thorne. Third row: 1. David Irvine, 2. Mildred Lenn, 3. Robert Jansen, 4. Dorothy Collins, 5. Jean Castro, 6. Dorothy Faria, 7. Vivian Wallace, 8. James Tysor, 9. Eloise Spencer, 10. Omery Smith. Fourth row: 1. Zita Fehrenbach, 2. Jack Anderson, 3. June Harper, 4. Thomas Beaudet, 5. Mary Horwath, 6. Mario Valperga, 7. Barbara Jackson, 8. Leroy Hall, 9. Nella Albo. Fifth row: 1. Marion Beauchamp, 2. Richard Saylor, 3. Delores Cerruti, 4. Barbara Maciel, 5. Bruce Spillers, 6. Angelina Vigorito. Class members not pictured: Military service: Rufus Andrade, Alfred Alviso, Jack Baird, Ben Carter, Eddie Cruz, George Cragholm, Bob Holm, Donald Jason, Erwin Mueller, Henry Nunes, Arnold Silva, Wayne Smith, Robert Volponi. Arroyo Sanatorium: Jaunita Fernandez. Credits: From the collection of Richard Saylor. 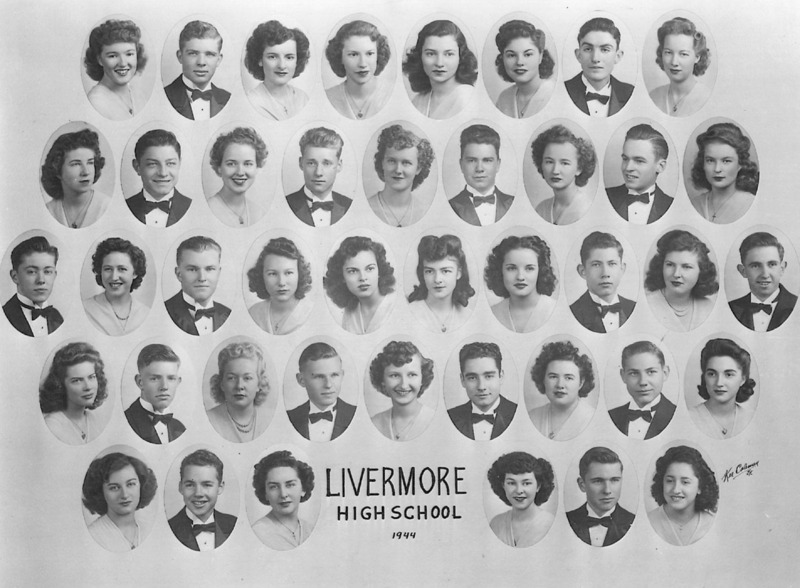 To find other pictures of the class of 1944 in the archive, see Livermore class pictures listed by year of high school graduation: 1944. And if you have any pictures of the class of 1944 that you would like to share, please submit them to the Archive.